Nancy has won a Creative Scholarship from the Interior Design Educators Council. She has been asked to give a presentation about the Iraq Names Project at the IDEC International Conference in Montreal in March. Closer to home, she will present the project to the Grant High School Human Rights Club on December 18th. Then she will present at the Portland Community College Art Beat Week in May 2008. If you would like Nancy to talk about the Iraq Names Project and give a slide presentation to your organization send me an email. dan.namesproject at gmail.com. 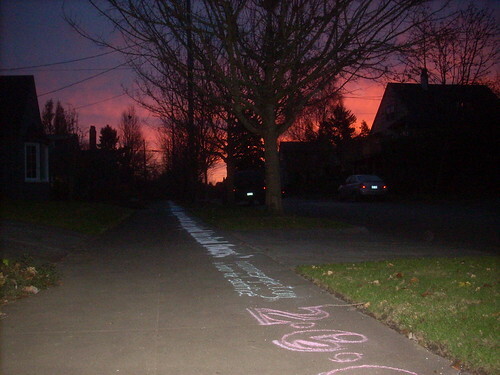 Nancy was drawing early one morning this week when the trash recycler stopped and asked her what she was doing. Nancy explained the project and gave him a hand out. “You just wrote my name” he said. He told Nancy he had never met anyone with his name. Ross Clevenger was 21 years old when he died February 8, 2007. Rocco, as he was called, believed in the unbelievable. From Givens Hot Springs, Idaho, he was a fan of Big Foot and knew all about dinosaurs. 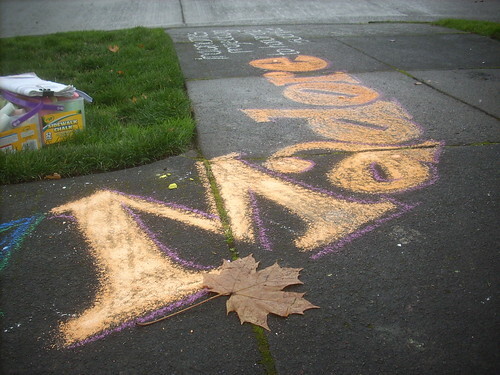 No chalking Sunday December 2nd. 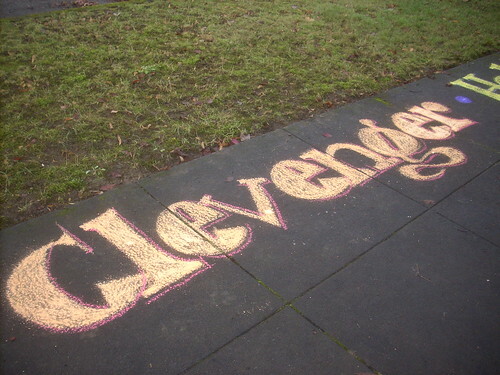 If the weather is more dry than wet, more still than moving, drawing names will happen. 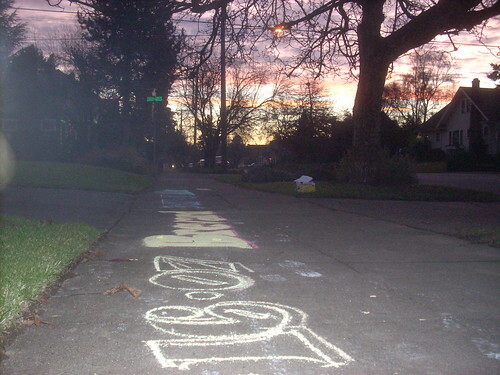 On December 1st Nancy went out into the weather and tried to chalk. It was snowing when she started, then it cleared up, but then it started to rain. The unpredictability was driving her crazy, so she went home after writing Madore. You are currently browsing the Iraq Names Project blog archives for December, 2007.